So I’ve finally got reviewing this, I’ll be doing Timorous Beastie and the regular Rock Oyster over the next couple of months. 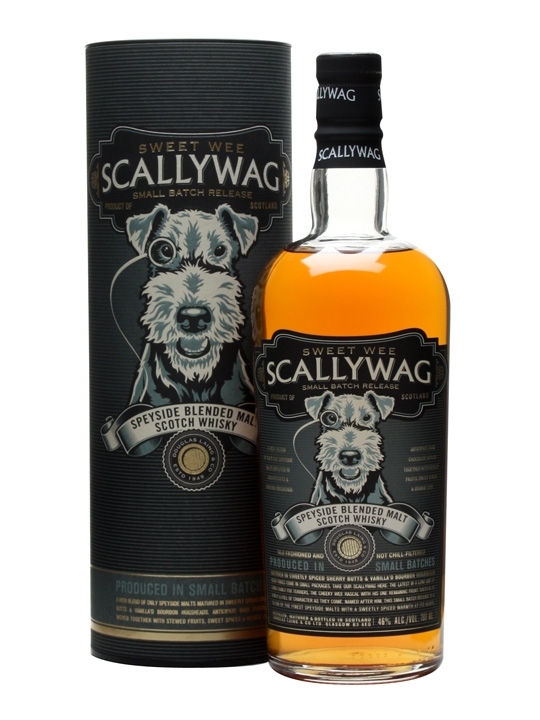 Part of a series of four Blended Malts Scallywag is the wagging tail of Speyside and includes Mortlach and Macallan and comes in at 46%. I bought this pure ages ago and decanted a few drams worth which is where I’ve taken my notes from. Nose. Obvious sweetness, both sherry and bourbon casks have been used here so I catch buttermilk icing, melting sugar and candied fruits, lime and grapefruit. sweet honey covered porridge. Palate. Sweet and oat filled, porridge with caster sugar and cream, the grapefruit and lime give way to candied lemon and orange rind, a sherry rich blend with some bourbon vanilla coming through, a little touch of cinnamon and all spice. Finish. Medium, sweetness and fruity, very much a drinking dram this, very nice. A short and sweet review, I don’t have any smart arsed comments to make here because it’s just a good all rounder, it’s under forty pounds too so not too harsh on the wallet and Douglas Laing once again proving how good Blends can be if they are in the right hands.